(15/120) TRENTON – Department of Environmental Protection Commissioner Bob Martin today sharply criticized a U.S. Army Corps of Engineers’ (USACE) contractor for making plans to remove dredging equipment from an ongoing beach and dune construction project on Long Beach Island in order to perform a dredging project in another part the country. Great Lakes Dredge & Dock Company, which since May has been implementing a $128 million contract to construct engineered beaches and dunes for 13 miles of Long Beach Island, recently announced it is moving its dredges out of New Jersey to work on another project. The company does not plan to return the dredges to New Jersey until spring 2016. Local and federal officials joined Commissioner Martin in calling upon Great Lakes to continue work in this area without disruption. “I share in the deep disappointment at Great Lakes’ decision to leave LBI and our critical beach replenishment project half-completed, subject to the winter weather and storm surges common this time of year,” said Congressman Frank LoBiondo (NJ-2). “In close communication and coordination with Commissioner Martin, local mayors and the Army Corps, I have made clear on several occasions to Great Lakes’ leadership of my immense frustration at this self-serving business decision that leaves the residents and properties of LBI at risk. Long Beach Township Mayor Joseph H. Mancini worries that Holgate, along the southern portion of the island, will be particularly vulnerable to winter nor’easters. The federally-funded project is being undertaken as part of the Christie Administration’s strategy to build a comprehensive coastal protection to protect from the kind of destruction the state witnessed during Superstorm Sandy in October 2012. 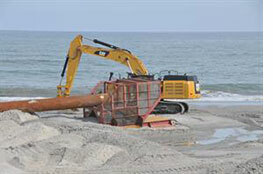 Formally known as the Barnegat Inlet to Little Egg Inlet project, it is one of seven significant USACE beach improvement projects statewide authorized by Congress but never completed before Sandy hit. The projects encompass a total of 12.7 miles of beaches in Long Beach Township, Ship Bottom, Beach Haven and part of Surf City. They will complete storm damage reduction projects that were being constructed in phases prior to Sandy striking New Jersey in October 2012. The contract to complete the initial construction on LBI is funded 100 percent by the federal government under the provisions of the Sandy Relief Act enacted in 2013. Construction on Long Beach Island began this past May and involves construction of a dune system with a top elevation of 22 feet. The beach and dune system being constructed will range from 300 to 400 feet wide and have an elevation of eight feet above sea level, better protecting the island against storm surge. Three main areas still need to be filled: Area 6, which encompasses Beach Haven and the Holgate section of Long Beach Township; Area 1, which encompasses the Loveladies section of Long Beach Township; and Area 2, which encompasses the North Beach section of Long Beach Township. The state has title for all of the properties in Area 6, which is the southern end of the project and the most vulnerable to severe damage from winter storm. Only a handful of easements are still required for Areas 1 and 2, but they are expected to be obtained within weeks.